Alnylam Announces First-Ever FDA Approval of an RNAi Therapeutic, ONPATTRO™ (patisiran) for the Treatment of the Polyneuropathy of Hereditary Transthyretin-Mediated Amyloidosis in Adults | Alnylam Pharmaceuticals, Inc.
CAMBRIDGE, Mass.--(BUSINESS WIRE)--Aug. 10, 2018-- Alnylam Pharmaceuticals, Inc. (Nasdaq: ALNY), the leading RNAi therapeutics company, announced today that the United States Food and Drug Administration (FDA) approved ONPATTRO™ (patisiran) lipid complex injection, a first-of-its-kind RNA interference (RNAi) therapeutic, for the treatment of the polyneuropathy of hereditary transthyretin-mediated (hATTR) amyloidosis in adults. ONPATTRO is the first and only FDA-approved treatment for this indication. hATTR amyloidosis is a rare, inherited, rapidly progressive and life-threatening disease with a constellation of manifestations. In addition to polyneuropathy, hATTR amyloidosis can lead to other significant disabilities including decreased ambulation with the loss of the ability to walk unaided, a reduced quality of life, and a decline in cardiac functioning. In the largest controlled study of hATTR amyloidosis, ONPATTRO was shown to improve polyneuropathy – with reversal of neuropathy impairment in a majority of patients – and to improve a composite quality of life measure, reduce autonomic symptoms, and improve activities of daily living. The FDA approval of ONPATTRO was based on positive results from the randomized, double-blind, placebo-controlled, global Phase 3 APOLLO study, the largest-ever study in hATTR amyloidosis patients with polyneuropathy. Results from the APOLLO study were published in the July 5, 2018, issue of The New England Journal of Medicine. In APOLLO, the safety and efficacy of ONPATTRO were evaluated in a diverse, global population of hATTR amyloidosis patients in 19 countries, with a total of 39 TTR mutations. Patients were randomized in a 2:1 ratio to receive intravenous ONPATTRO (0.3 mg per kg of body weight) or placebo once every 3 weeks for 18 months. The study showed that ONPATTRO improved measures of polyneuropathy, quality of life, activities of daily living, ambulation, nutritional status and autonomic symptoms relative to placebo in adult patients with hATTR amyloidosis with polyneuropathy. The primary endpoint of the APOLLO study was the modified Neuropathy Impairment Score +7 (mNIS+7), which assesses motor strength, reflexes, sensation, nerve conduction and postural blood pressure. Patients treated with ONPATTRO had a mean 6.0-point decrease (improvement) in mNIS+7 score from baseline compared to a mean 28.0-point increase (worsening) for patients in the placebo group, resulting in a mean 34.0-point difference relative to placebo, after 18 months of treatment. While nearly all ONPATTRO-treated patients experienced a treatment benefit relative to placebo, 56 percent of ONPATTRO-treated patients at 18 months of treatment experienced reversal of neuropathy impairment (as assessed by mNIS+7 score) relative to their own baseline, compared to four percent of patients who received placebo. Patients treated with ONPATTRO had a mean 6.7-point decrease (improvement) in Norfolk Quality of Life Diabetic Neuropathy (QoL-DN) score from baseline compared to a mean 14.4-point increase (worsening) for patients in the placebo group, resulting in a mean 21.1-point difference relative to placebo, after 18 months of treatment. As measured by Norfolk QoL-DN, 51 percent of patients treated with ONPATTRO experienced improvement in quality of life at 18 months relative to their own baseline, compared to 10 percent of the placebo-treated patients. Over 18 months of treatment, patients treated with ONPATTRO experienced significant benefit vs. placebo for all other secondary efficacy endpoints, including measures of activities of daily living, walking ability, nutritional status, and autonomic symptoms. The most common adverse events that occurred more frequently with ONPATTRO than with placebo were upper respiratory tract infections and infusion-related reactions. To reduce the risk of infusion-related reactions, patients received premedications prior to infusion. ONPATTRO is expected to be available for shipment to healthcare providers in the U.S. within 48 hours. Alnylam is committed to helping people access the medicines they are prescribed and will be offering comprehensive support services for people prescribed ONPATTRO through Alnylam Assist™. Visit AlnylamAssist.com for more information or call 1-833-256-2748. Visit ONPATTRO.com for more information, including full Prescribing Information. Alnylam management will discuss the FDA approval via conference call today, August 10, 2018, at 3:00 p.m. ET. A webcast presentation will also be available on the Investors page of the Company's website, www.alnylam.com. To access the call, please dial (800) 682-0995 (domestic) or (334) 323-0509 (international) five minutes prior to the start time and refer to conference ID 7371935. A replay of the call will be available beginning at 6:00 p.m. ET on August 10, 2018. To access the replay, please dial (888) 203-1112 (domestic) or (719) 457-0820 (international) and refer to conference ID 7371935. ONPATTRO was approved by the U.S. Food and Drug Administration (FDA) for the treatment of the polyneuropathy of hereditary transthyretin-mediated (hATTR) amyloidosis in adults. ONPATTRO is the first and only RNA interference (RNAi) therapeutic approved by the FDA for this indication. ONPATTRO utilizes a novel approach to target and reduce production of the TTR protein in the liver via the RNAi pathway. Reducing the TTR protein leads to a reduction in the amyloid deposits that accumulate in tissues. ONPATTRO is administered through intravenous (IV) infusion once every 3 weeks following required premedication and the dose is based on actual body weight. Home infusion may be an option for some patients after an evaluation and recommendation by the treating physician, and may not be covered by all insurance plans. Regardless of the setting, ONPATTRO infusions should be performed by a healthcare professional. For more information about ONPATTRO, visit ONPATTRO.com. Hereditary transthyretin (TTR)-mediated amyloidosis (hATTR) is an inherited, progressively debilitating, and often fatal disease caused by mutations in the TTR gene. TTR protein is primarily produced in the liver and is normally a carrier of vitamin A. Mutations in the TTR gene cause abnormal amyloid proteins to accumulate and damage body organs and tissue, such as the peripheral nerves and heart, resulting in intractable peripheral sensory neuropathy, autonomic neuropathy, and/or cardiomyopathy, as well as other disease manifestations. hATTR amyloidosis represents a major unmet medical need with significant morbidity and mortality. The median survival is 4.7 years following diagnosis. Until now, people living with hATTR amyloidosis in the U.S. had no FDA-approved treatment options. As part of Alnylam’s commitment to making therapies available to those who may benefit from them, Alnylam Assist will offer a wide range of services to guide patients through treatment with ONPATTRO, including financial assistance options for eligible patients, benefit verification and claims support, and ordering assistance and facilitation of delivery via specialty distributor or specialty pharmacy. Patients will have access to dedicated Case Managers who can provide personalized support throughout the treatment process and Patient Education Liaisons to help patients gain a better understanding of the disease. Visit AlnylamAssist.com for more information. RNAi (RNA interference) is a natural cellular process of gene silencing that represents one of the most promising and rapidly advancing frontiers in biology and drug development today. Its discovery has been heralded as “a major scientific breakthrough that happens once every decade or so,” and was recognized with the award of the 2006 Nobel Prize for Physiology or Medicine. RNAi therapeutics are a new class of medicines that harness the natural biological process of RNAi. Small interfering RNA (siRNA), the molecules that mediate RNAi and comprise Alnylam's RNAi therapeutic platform, function upstream of today’s medicines by potently silencing messenger RNA (mRNA) – the genetic precursors – that encode for disease-causing proteins, thus preventing them from being made. This is a revolutionary approach in developing medicines to improve the care of patients with genetic and other diseases. Alnylam (Nasdaq: ALNY) is leading the translation of RNA interference (RNAi) into a whole new class of innovative medicines with the potential to improve the lives of people afflicted with rare genetic, cardio-metabolic, and hepatic infectious diseases. Based on Nobel Prize-winning science, RNAi therapeutics represent a powerful, clinically validated approach for the treatment of a wide range of severe and debilitating diseases. Founded in 2002, Alnylam is delivering on a bold vision to turn scientific possibility into reality, with a robust discovery platform. 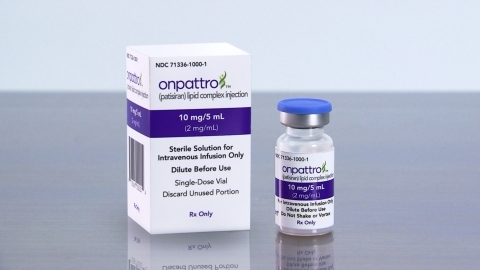 ONPATTRO, available in the U.S. for the treatment of the polyneuropathy of hereditary transthyretin-mediated (hATTR) amyloidosis in adults, is Alnylam’s first U.S. FDA-approved RNAi therapeutic. Alnylam has a deep pipeline of investigational medicines, including three product candidates that are in late-stage development. Looking forward, Alnylam will continue to execute on its "Alnylam 2020" strategy of building a multi-product, commercial-stage biopharmaceutical company with a sustainable pipeline of RNAi-based medicines to address the needs of patients who have limited or inadequate treatment options. Alnylam employs over 800 people worldwide and is headquartered in Cambridge, MA. For more information about our people, science and pipeline, please visit www.alnylam.com and engage with us on Twitter at @Alnylam or on LinkedIn. Various statements in this release concerning Alnylam's future expectations, plans and prospects, including, without limitation, Alnylam's views with respect to the approval of ONPATTRO™ (patisiran) lipid complex injection, including the approved indication, and the implications of such approval for patients, the results from its APOLLO Phase 3 clinical trial for patisiran, its expectations concerning when ONPATTRO will be available for shipment to healthcare providers in the U.S., its plan to offer comprehensive support services for people prescribed ONPATTRO through Alnylam Assist™, the expected timing for additional regulatory filings for approval in global markets, its expectations regarding the potential for patisiran to improve the lives of hATTR amyloidosis patients with polyneuropathy and their families, its plans to work with the FDA to expand the indication for ONPATTRO in the future, and expectations regarding its "Alnylam 2020" guidance for the advancement and commercialization of RNAi therapeutics, constitute forward-looking statements for the purposes of the safe harbor provisions under The Private Securities Litigation Reform Act of 1995. Actual results and future plans may differ materially from those indicated by these forward-looking statements as a result of various important risks, uncertainties and other factors, including, without limitation, Alnylam's ability to discover and develop novel drug candidates and delivery approaches, successfully demonstrate the efficacy and safety of its product candidates, the pre-clinical and clinical results for its product candidates, which may not be replicated or continue to occur in other subjects or in additional studies or otherwise support further development of product candidates for a specified indication or at all, actions or advice of regulatory agencies, which may affect the design, initiation, timing, continuation and/or progress of clinical trials or result in the need for additional pre-clinical and/or clinical testing, delays, interruptions or failures in the manufacture and supply of its product candidates, obtaining, maintaining and protecting intellectual property, Alnylam's ability to enforce its intellectual property rights against third parties and defend its patent portfolio against challenges from third parties, obtaining and maintaining regulatory approval, pricing and reimbursement for products, progress in establishing a commercial and ex-United States infrastructure, successfully launching, marketing and selling its approved products globally, Alnylam’s ability to successfully expand the indication for ONPATTRO in the future, competition from others using technology similar to Alnylam's and others developing products for similar uses, Alnylam's ability to manage its growth and operating expenses, obtain additional funding to support its business activities, and establish and maintain strategic business alliances and new business initiatives, Alnylam's dependence on third parties for development, manufacture and distribution of products, the outcome of litigation, the risk of government investigations, and unexpected expenditures, as well as those risks more fully discussed in the "Risk Factors" filed with Alnylam's most recent Quarterly Report on Form 10-Q filed with the Securities and Exchange Commission (SEC) and in other filings that Alnylam makes with the SEC. In addition, any forward-looking statements represent Alnylam's views only as of today and should not be relied upon as representing its views as of any subsequent date. Alnylam explicitly disclaims any obligation, except to the extent required by law, to update any forward-looking statements.